Kevin Harvick is smiling ... and so is Harvick fan Louise Groomer. 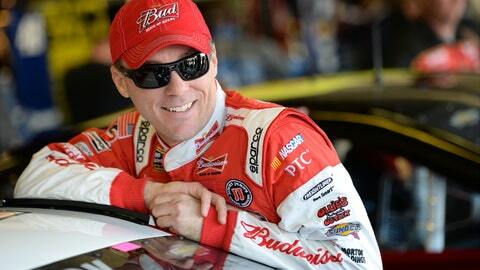 Good things come to those who politely ask Kevin Harvick to follow them on Twitter. That’s exactly what Oregon resident and Happy fan Louise Groomer did. What happened next is pretty amazing. Here’s the Tweet that got things started. @KevinHarvick Please, will you follow me? Not only did Harvick give Groomer a follow, but after some back and forth banter he eventually offered up an all-expenses-paid trip to the 2014 Daytona 500. Hey @LouiseGroomer why don't you come to the Daytona 500 as my guest? Everything's on me! Flight, room, tickets you name it! Was Groomer interested? You could say that. @KevinHarvick HELLYES!!! Can I bring my husband??? Yes, her husband will be joining her in Florida. And in addition to the trip of a lifetime, it also looks like Louise has been added to Harvick’s entourage. “@2448fan4life: @KevinHarvick please follow me Kevin huge fan?” I'm sorry all new follow requests must be approved by @LouiseGroomer. Congrats Louise! See you in Daytona.